Jeff's original Patron Saints drumhead created by Jonny Wild, circa 1966. 60s Gibson Melody Maker like the one I first played in 1966. I was bitten by Rock 'n' Roll in a big way. I tried to learn guitar in my early teens, but playing "Michael, Row The Boat Ashore" didn't really do it for me, so I didn't pursue it. Unfortunately, I had been saddled with a trombone, which I had been forced to learn, since the fourth grade. I was sick the day you got to pick the instrument you wanted to play, and so was not able to get my first choice...drums. So I suffered through puberty, sliding on the trombone and loathing every minute of it. 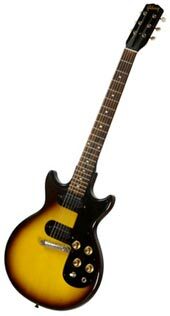 My life changed completely when, at the age of fifteen, my brother Tom's friend, Geoff Sisson, brought a beautiful, early '60s, double-pickup tobacco sunburst Gibson Melody Maker electric guitar (which I would kill to have today!) with a small Gibson amp over to our house and let me play it. As he hooked everything up, I could sense something "big" happening in my life. Geoff showed me how to play a simple riff and that was it. Completely smitten. That afternoon, my brother Tom and I, Mr. Instant Gratification, went down to White Plains, New York to find a guitar for me. Somehow. Someway. I had $15 and my trombone to trade...that was it. After going to three different music stores and being offered no more than $20 for the trombone, we went to the somewhat shady "Ace Pawn Shop" as a last resort. In the window was a new semi-acoustic, Kent guitar (quite similar to the Harmony Rocket to the right) with a single ceramic neck pick up for $35!!! Cleverly adding $15 and $20 in my head, I finally saw the light at the end of the tunnel! Of course, they offered me $20 for my trombone as well, but this time I couldn't resist, so within minutes, we were walking back to the car with my new and, more importantly, first guitar! Needless to say, I was completely psyched. That is, until my father got home. It seemed he didn't appreciate me trading in a fairly new trombone for $20 without asking. And for an electric (such as it was) guitar! What was I thinking? And then he uttered the famous family phrase that I would throw back at him every chance I got: "You'll never play the damn thing...it'll be in the back of the closet in a week!" After much whining and moping, he finally gave in. I don't even want to think of what I would have done if he had said no. So I won't. 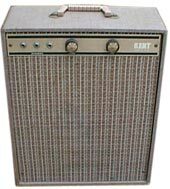 My first-ever guitar amp, an 8-watt Kent, purchased around the same time as my first guitar. The only exisiting photo of my 1966 sunburst Hagstrom III. So now it's early 1966, I'm playing constantly, and learning a few new chords. Hey, I'm ready to start a band now! For some reason, I was always ready to start a band, even when I didn't play anything but a trombone. It turned out that two of the kids who lived right up/down the street from me in my Chappaqua, New York neighborhood had similar aspirations. Frank Stapleton, whom I had known for a couple of years at school, played guitar and Jeff Alfaro, whom I had known from before I could remember (aside from my brother, Jeff is my oldest friend), was interested in playing drums. By interested, I mean we needed a drummer, so he was elected, even though he didn't own any drums and wouldn't have known how to play them if he had! But the three of us were completely locked into the idea of starting a group, so a lack of real instruments didn't mean anything to us. We started practicing at my house, ampless and drumless; Frank settled on rhythm guitar and I sort of defaulted to lead guitar, in a limited fashion. Jeff used the back of the "E" book of our World Book Encyclopedia as a drum pad (it still has gouge marks), but after endlessly mowing lawns in the summer of 1966, he finally earned enough money for a used set of Gretsch/Slingerland drums (which I he still has and uses). Slowly, but surely, we got better...we did a relatively good version of Them's "Gloria" way before the Shadows Of Knight did...I had a fleeting idea that we should record it and put out a single! That's right, even then I was into the concept of independent recording. Within weeks, the Shadows of Knight version came out, so back to the drawing board. I don't quite remember how I afforded it, but somwhow, I managed to buy a new, sunburst Hagstrom III electric 6-string around this time. Things were really picking up (no pun intended). 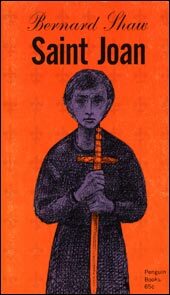 Saint Joan book cover which inspired our name in 1966. We didn't have a name for the group yet. We all came up with the usual corny choices that every band tries at first; The Lampshades, The Tables, The Cars...well, I guess we should have kept that last one. One day, while I was sitting on the bus to school, I happened to glance down at the pile of school books on my lap. We had just begun reading George Bernard Shaw's Saint Joan. Eureka! The Saints!!! We finally had a name! A few weeks later, I heard a radio ad for a show that featured a group called The Saints. Disappointed, but undeterred, I added 'Patron' in front. So we had a name, some instruments and we knew a few songs. Something was missing, but we didn't know quite what. Until August of 1966, that is. Pete Wolman was a school buddy of mine. One day in July, he called me to say that a childhood friend of his, Jon Tuttle, was moving back to Pleasantville, New York from South Africa. He was supposed to be an amazing (according to Jon, of course) guitar player, especially for a sixteen year old. Did I think he could join the Saints? I remember being completely defensive...Hey, I play guitar, who needs this guy? Pete reminded me that we needed personnel and that all I had to do was meet him, OK? So, a few weeks later Pete brought Jon over to my house for the big encounter. Bruce Miller and Jeff Alfaro rocking out on September 5, 1967. Jeff Alfaro, Bruce Miller and Frank Stapleton on September 5, 1967. As you can see from the photo below ( left to right: Jon Tuttle, Eric Bergman, Bruce Miller, Jeff Alfaro, Frank Stapleton), Jon was fairly Buddy Holly-ish looking and very polite...I remember him using the word "rubbish" at one point. After exchanging pleasantries, we set off for a back room like two gunslingers at high noon. John whipped out his trusty red Hofner 173ii and I strapped on my Hagstrom III. After establishing that we were both certifiable Stones fanatics, the first thing we ever played together was The Last Time. As soon as I heard Jon play nail the solo perfectly, my immediate thought was "I wonder how hard it would be for me to learn to play the bass?" And that's exactly what I did! Jon was light-years ahead of me, Frank and anyone we knew. My gut feeling said "Do not let this guy get away!," and we didn't. 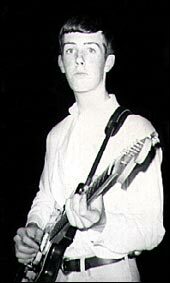 Frank Stapleton, rhythm guitar, with his sunburst Fender Jazzmaster on September 5, 1967. So now there were four Saints, with Jon on lead guitar. For the time being, I played bass on the lower four strings of my Hagstrom III. Instrumentally, we were now sounding quite respectable. But we really needed a lead singer. Enter Bruce Miller, another school friend whom I had known since we had gone to Sunday School together as little kids. Not only could he sing, he played keyboards. What's more, he owned an Ace Tone organ. He was also learning to play harmonica, which we wanted to incorporate, since it turned out that we were all major Stones fanatics! Bruce also had the most supportive family...we were able to practice at his house constantly. Now we were five. 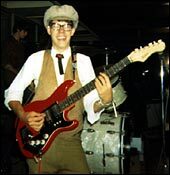 We played a lot of local gigs around the Westchester County, NY/Fairfield County, CT area back then, performing an interesting mix of music; 85% Rolling Stones and 15% Paul Butterfield Blues Band, Blues Project, Spencer Davis Group, The Kinks, Buffalo Springfield, Yardbirds, Doors, Moby Grape, etc. We were friends as well as bandmates, so we generally got on pretty well. 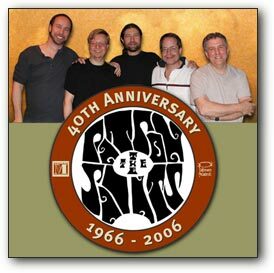 I recorded a lot of our gigs...forty years later, we still sound great to me! We built up a fairly large local following and had a great crew who hung with us at all times, affectionately known as The Auxiliary; Pete Wolman, Linda Pankuch, Tara Head, Shirley Lanners, Charlie Wilhelm, Linnie Beauchamp, my brother Tom and others all played an important part in Saint history...there's no way we would have survived without their constant support. Here's a poster created by artist and Patron Saints Auxiliary member, Jonny Wild, back in September of 1967 for a gig we played at Horace Greeley High School in Chappaqua. Me, with my 1966 Hofner Beatle bass, on September 5, 1967. The five original Patron Saints played together from September 1966 to about November or December 1967. 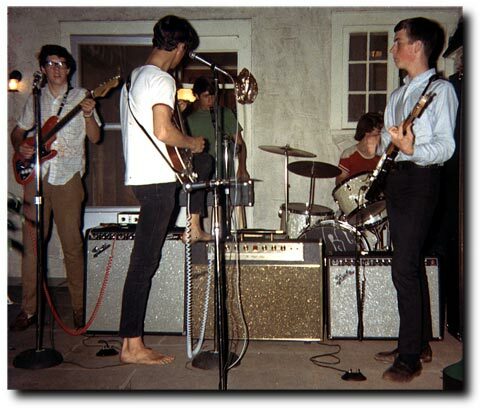 At that point, Frank left the group (I can't recall why) and school friend Casey Aspray took up rhythm guitar duties. As I remember, he had a beautiful Gretsch Double Anniversary in red, a very rare color for that model. We continued with this line up until about April or May 1968 when, for some reason that escapes me, Jon, Jeff and I broke off and formed the first Patron Saints power trio. We gave it a shot, but it was half-hearted at best. There were a couple of reunion jams with the original five members (and musician friend Chris Kubie sitting in on keyboards) in the Fall of 1968, but basically, that was it. 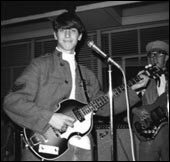 Jon Tuttle, lead guitar, with his beloved candy apple red Hofner 173ii on September 5, 1967. 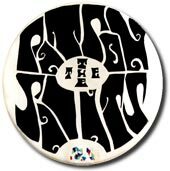 The last gig we ever played as the original five was on November 22, 1968 at Byram Hills High School in Armonk, New York, when we were known, inexplicably, as 'Fribberabbit' for one gig, a bizarre name concocted by a college acquaintance of mine. Here's the front page story in the April, 1969 Byram Hills Chronicle reporting that engagement and the Patron Saints breakup. All photos of the Patron Saints from September 5, 1967 taken by Linda Pankuch. Photo of the five original Patron Saints in 1967 taken by Jean Lombardi.